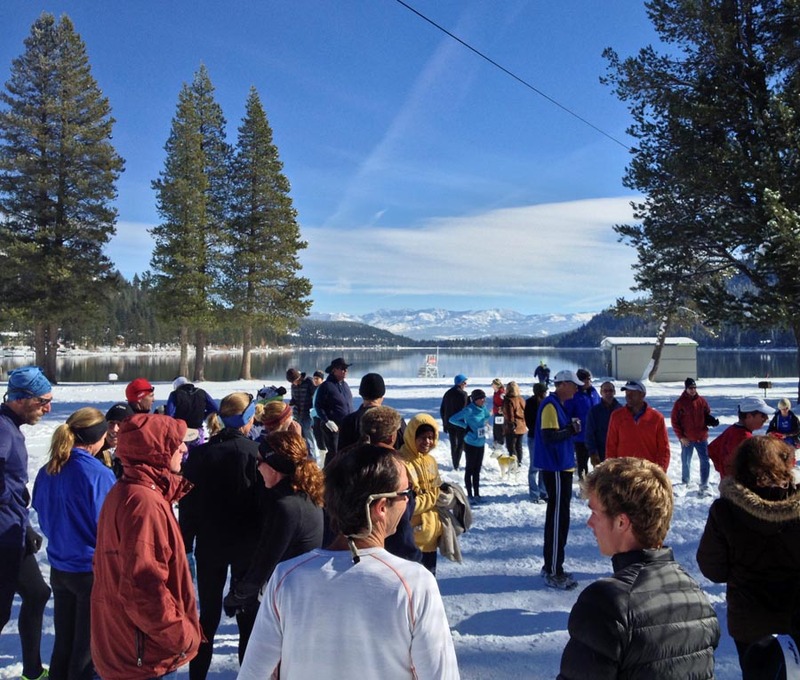 The 36th annual Donner Lake Turkey Trot took place under a bright blue sky with plenty of sunshine. Never mind the snow on the ground and the overnight temperatures in the single digits. 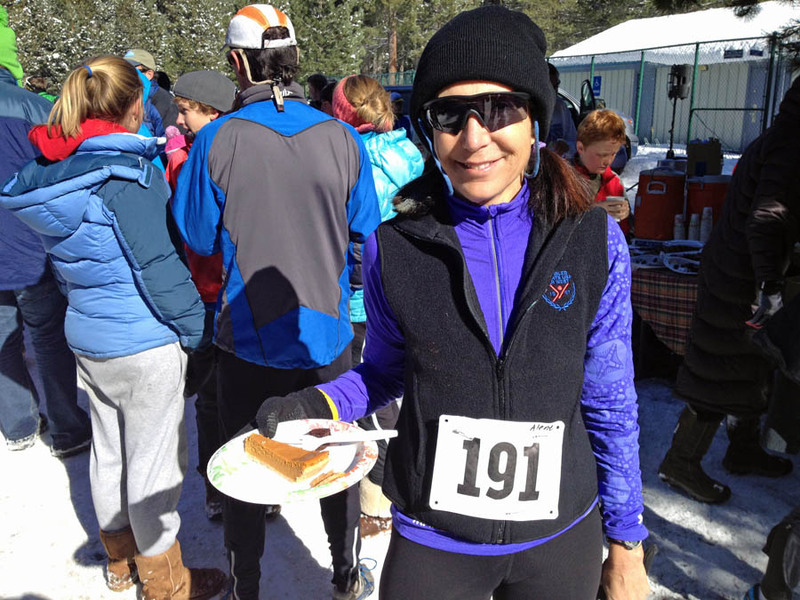 Everyone dressed warmly to run, have fun and eat pumpkin pie. Race Director Sally Jones said there were nearly 240 registered entrants for the three events. 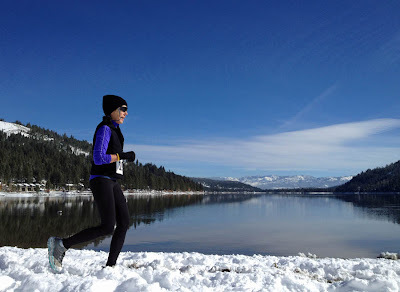 The Turkey Trot has a walkers division, a kid’s race and a 7 mile run around the lake. This year, the course was changed due to safety issues with the snow and ice on the roadway. Therefore, a course was painted on the snow within the West-End Beach property. The kids ran the loop course once and the walkers and runners completed 4 loops. 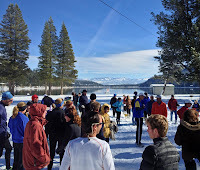 Running through 10-12 inches of snow turned the run into an adventure race. You could blaze your own trail through the powder or follow others in a conga line to save energy. After about 2 laps, there were two “paths” that you could follow to avoid running through strength sapping powder. My wife and I had a fun time looping through the beach property, while enjoying the lake views. Everyone enjoyed the run and the finish line goodies. There is no award ceremony at the Turkey Trot, but there are raffle prizes galore. As usual, just about everyone present “won” a prize. Proceeds from the event go to the Auburn Ski Club Junior Nordic Team. Put this on your list of races to run if you like low-key events with a home-town feel. Results are available on the Auburn Ski Club website.